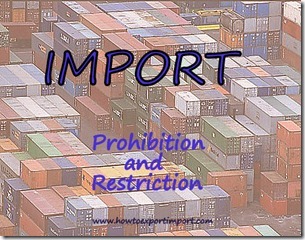 How to differentiate restriction and prohibition in import? What is restriction of goods to import? Prohibition of import of goods, what does it mean? Most of the restricted goods can be imported by lifting off such restrictions by government of importing country by following necessary procedures and formalities. However, prohibited goods are not allowed to import to such importing country. What you mean by restriction to import? If any goods are restricted to import, the government fixes some sort of barriers to import, which importer has to overcome such barriers. Means, certain procedures have to be completed to import such restricted products. The details about restriction of goods to import are explained in another article in this web blog. Click here to read: Restriction to import goods. What do you mean by prohibition to import? If any import of goods adversely affects the health of human, animal, plants and other species, such goods also may be prohibited to import by the government of importing country. More details are available in another article in this web blog: Click here to read – Meaning of prohibition to import goods. 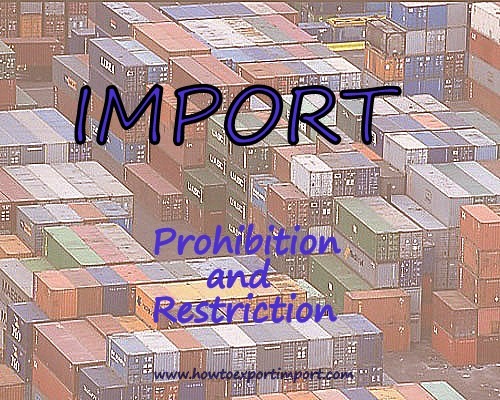 Once after going through the above two articles, you will have a basic idea about the difference between restriction and prohibition of imports. Share your thoughts about the difference between restriction and prohibition in terms of imports. Write below your vies about difference between restriction to import and prohibition to import. How to import products of OIL SEEDS, MEDICINAL PLANTS and MEDICINAL STRAW?